Added on October 25, 2016 by Loraine Monk. We agreed to have a Private View for two hours on the Saturday evening 5-7pm.. 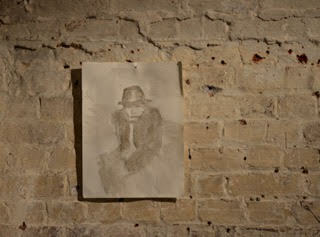 I set up two rooms showing both the sketches in the paint made from dust and black ink.. In the afternoon I painted two further images on thin white fabric. The first another image of the homeless man on the park bench, I hung over some step ladders and then litwith a strong battery powered lamp… the other, a new image, of a homeless woman sleeping in a park, I hung over a chain of fairy lights hanging from a wall. Just before the pop up exhibition opened, I began a new drawing, using ink on watercolour paper, attached to the wooden wall by masking tape. It was of the man in a cap queing for a workhouse ticket. I continued it as the exhibition progressed. Because the walls were wet, it didn’t dry till I got back home, the next day I added white chalk. My work practice is inspired by the history of the place and the fact that while five hundred bodies were placed in St Pancras Crypt to rest for eternity, outside hundreds of thousands of people lived in poverty, many homeless, sleeping in the street. London’s population had increased from one million in 1800 to 6.7 million a century later. At the start of the twentieth century 939 out of a 1000 people in London died of poverty... 1 in 4 in the workhouse, infirmary or lunatic asylum….. 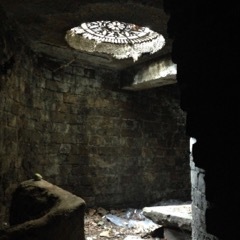 Inspired by THE PEOPLE OF THE ABYSS, Jack London’s observations of how poverty operated in London in 1902, I used the photographic images to trace the figures of the homeless and destitute, who would neither rest in such a place as the crypt, alive or dead…. The images were created using ink and paint mediums made from the dust in the Crypt. The first few days were spent making paints from the dust of the crypt.. I experimented with various paint images... all of them came out inevitably brown. After all the rich dead of Edwardian London had had fine houses when alive and the shelter of the crypt, when dead... but the poor had no such shelter, alive or dead.. 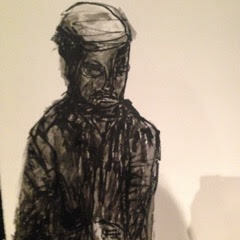 I made ink drawings, using black non waterproof indian ink. The images I used were taken from photographs of the homeless lying in parks, huddled on benches, quing up for entry into work houses..
Added on October 11, 2016 by Loraine Monk.